* No changes in our weekly key reversal levels for major stock indexes. * On the daily level we have some flip-flopping going on. Nasdaq and S&P 500 have joined the Nikkei by going into bearish mode with downward momentum (MoM). The DAX and FTSE100 remain in bullish mode, but also with downward MoM. * In other world markets we have a stronger picture with most emerging markets in ongoing bull market. * Bonds (TLT) continue to rally and have come within a few nickels of our Top1 target at 114.60. The Top2 target is at 115.70, so I expect some serious resistance just above the current levels. I you bought bonds when they turned bullish 16 weeks ago, I would look to take some profits off the table. * Gold holds just above its weekly key level and has entered rally mode on the daily level, but without much conviction so far. Its next major move also depends on which way the $EURUSD goes (see below). This chart shows why a big move is in the making for gold. * The Euro has closed below its weekly key level and is now bearish on the weekly level. This is a major change after 41 weeks of bullish status. If the new trend continues we can start eyeing the Bottom targets at 1.3390 and 1.2870, and it would probably push gold prices down as well. If the Euro recovers swiftly and gets back above 1.3844 (weekly close) then the odds reverse. * Our weekly key reversal levels for the 30 Dow stocks are available here. 24 stocks are bullish this week, unchanged from last week. Above 20 is healthy, see : Keeping an eye on the Dow stocks. Every new month is a good opportunity to check out some monthly charts and key reversal levels. It helps to keep a proper long term perspective. The LT wave chart for April did a fairly decent job. The month started strong as expected and was followed by a correction and a rebound in the last week. For May we have a rather mixed picture. 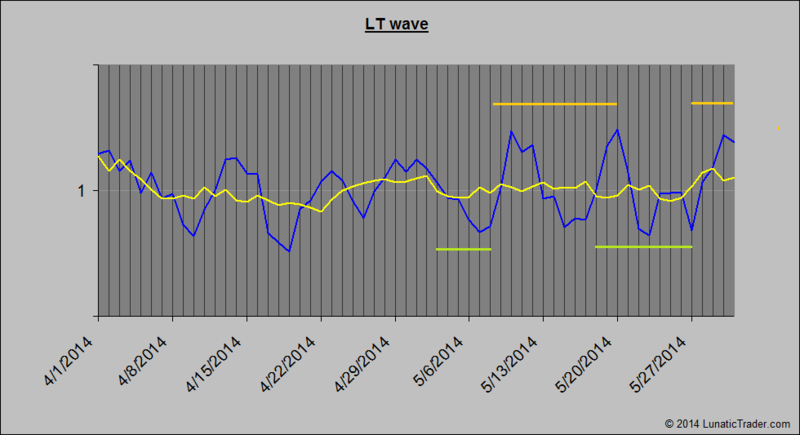 The LT wave peaks in the first days of the month and then a period with up and down swings. This doesn’t mean the month will be flat. I would look for highs and lows based on the blue line. This could be a series of higher highs and lows, or lower highs and lows. Don’t expect perfection. The LT wave gives good indications more than half of the time, but there are also stretches of poor performance, just like with every other system of cycle. 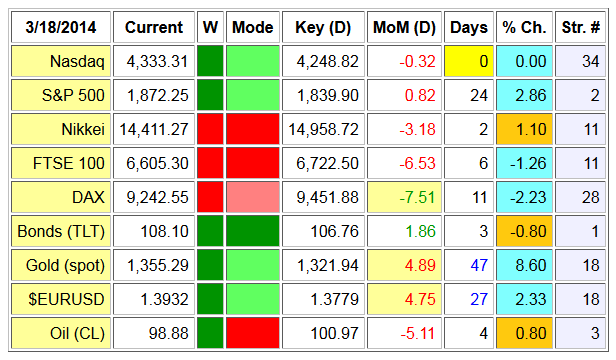 We have also updated our monthly key reversal levels for May 2014. Note: these monthly key reversal are only for long term market orientation. Try to invest mainly in the stronger markets (dark green) and take (partial) profits in markets that go to light green. Speculative buying can be done in the markets that switch from bearish (red) to mildly bearish (pink). A very patient long term investor can do well based on these monthly keys only, but for more optimal entry and exit points the weekly and daily key reversals can be used. We post them here on the blog and through twitter every week/day. * Monthly MoM is turning up again for the S&P 500. Bull markets do not give up easily. Most major markets remain well above their monthly key levels, so they are not even close to turning bearish. But a lengthy period of sideways action is still likely for these indexes. * Singapore is turning bullish. * Monthly MoM is turning up for Brazil, France, Malaysia and Turkey. * China, Mexico and Russia are the only markets that continue to be fully bearish. * The Nasdaq has continued its recent weakness and went into declining mode when it closed below its daily key reversal level last Monday. The S&P 500 and the Dow Jones have been stronger and have not dropped below any key levels yet. * The German DAX index has climbed back above its weekly key reversal level, so is now bullish again. But the move is suspect as weekly MoM remains to the downside, suggesting a possible false break out. We have to see whether this market shows proper follow through. * As mentioned last week, the $EURUSD is a market to watch. We now see weekly MoM turn down for the euro, which adds to evidence that the next move for the euro will be down. See also the long term monthly euro chart I posted on twitter yesterday. * Gold has continued to drop and now the weekly MoM is going down. Is likely to produce some dead cat bounce soon, but medium term it doesn’t look very good for gold right now and if the Euro weakens further it will also weigh on gold prices. * Bonds continue to show strength and are now fully bullish on weekly and daily level. Probably set to test their long standing Top1 target at 111.80. * Oil has turned bullish on the daily level, but its weekly MoM remains to the downside. This makes it questionable whether oil can build on its recent gains. Keep a stop loss near the daily key reversal level if you are long crude oil. * Our weekly key reversal levels for other world markets can be picked up here. * The weekly key reversal levels for the 30 Dow stocks are available here. 22 stocks are bullish this week. Above 20 is healthy, see : Keeping an eye on the Dow stocks. * There was a little glitch in my table calculations which caused the MoM indicator to be off in some cases. This is now completely fixed. * Weekly mode for S&P 500 is weak bullish (light green), not strong bullish as reported last weekend. The other markets were OK.
* Despite pushing to marginal new highs, most stock indexes continue to show declining MoM on the daily level (and thus weak bullish mode – light green). This means a pause or pullback is likely, so keep a stop-loss close to the market. If MoM turns back up it would indicate a continuation of the bull run. * $EURUSD is barely staying above its key reversal level. With MoM to the downside the euro could go into declining mode any day. * Nasdaq, S&P 500 and FTSE100 are back to fully bullish with upward MoM. Nikkei remains the weaker market, with the DAX still hesitating as well. * $EURUSD is seeing MoM turn up again, so bullish tendency for euro continues. 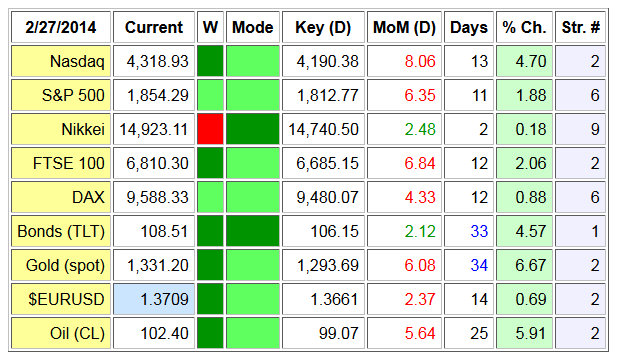 * All daily signals are nicely in the green (see %Ch. column). This shows the merits of simple trend following versus trying to forecast the next bottom or top. * Most stock indexes remain in strong bullish mode on the daily level, with Nikkei and DAX being the exceptions. Eventually the current stock market rally will peter out and then we will see MoM turn down for most markets. * Bonds (TLT), euro and oil are also in fully bullish pictures wit no signs of a top yet. Just go along until the bus stops. * Gold is hesitating after its recent strong rally. With MoM still at a relatively high 7.13 this pauze could continue for a while. If MoM turns back up before gold drops below its key reversal level, then it will be a good chance to enter (or add to) long gold positions. In a young bull market it is important to try to buy the dips. * Nasdaq has pushed above its long standing target at 4200, so 4390 is now the next Top1 target. * Momentum (MoM) is turning up for the S&P 500 and the FTSE 100. This is a first positive sign after almost two weeks of downside action. We now watch to see if they can get back into bullish mode by closing above their daily key reversal levels. * $EURUSD is also showing signs of life. MoM is turning back up after a rather brief decline. If the Euro can close above 1.3620 it will be back into bullish mode. * Stock markets remain in declining mode. MoM indicator reaching very pessimistic levels, so a bounce can start any day. *Oil (CL) is stalling just above its key reversal level. May turn bearish. * Stock markets remain in declining mode. But MoM is reaching pessimistic -6 values for many indexes. * $EURUSD has closed below its key reversal level and is now in declining mode. * Gold has failed to pick up steam and is seeing its MoM turn down again. Testing its key reversal level, and could easily go into decline mode (especially if weakness in the Euro continues). * Two new columns in the table from today. The “W” column just shows the weekly mode (see weekly key reversals posts), and the “Str. #” column is giving a strategy number. Depending on the daily and weekly market mode and direction of MoM there are different strategies, which I will explain in an upcoming article.